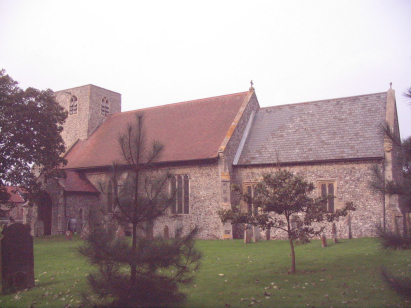 The parish of Trimingham sits on the North-east coast of Norfolk about 4 miles south-east of the resort of Cromer and north-west of Mundesley. The village is a straggle of houses along the narrow minor coastal road between Mundesley & Cromer. Steep sandy cliffs, nowadays eroding quickly and a danger to housing, lead to the beach. The occupations of the parish men are revealing, highlighting a split between the land and sea. Beach landed fish were a significant source of income and protein for this area in the past. St John the Baptist church lies at the centre of the small village, close to the major road junction. It is curious for its rather stumpy tower - many along this coast are tall and perform second duties as mariner's landmarks. 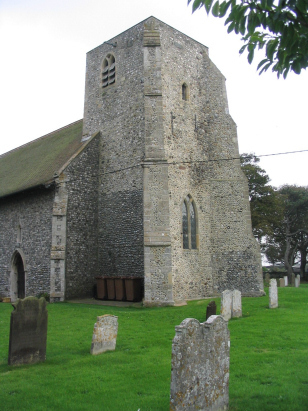 St John is fairly typical Norfolk 14th century but with much detail masked or modified by Victorian restoration in 1855 when much was rebuilt. A single standard 800-entry book forms a deposit which covers the period of this transcription and continues up to 1987. This register is filmed on microfilms MF697 & MF698 in the collection of the Norfolk Record Office and from which this transcript was prepared. The film although rather elderly and with faint often hazy images is up to the task and this was a fairly straightforward transcript to prepare. However it has to be stated that Trimingham was cursed by clerics with rather eccentric hands, indeed that of the initial few years being amongst the hardest yet to decipher. It is to be hoped that few errors have crept in but it cannot be guaranteed because of the writing quality.